Green is In! So we 've been researching and sourced more green options you can easily incorporate in your wedding. Today's little selection is representative of the variety of eco-friendly choices available online in Ontario-based The Thank You Company's store. They will ship anywhere in Canada, so check them out.. If you are looking for something really special and environmentally friendly for your wedding invitations, you have found it in the Do-It-Yourself Prestige invitation collection. 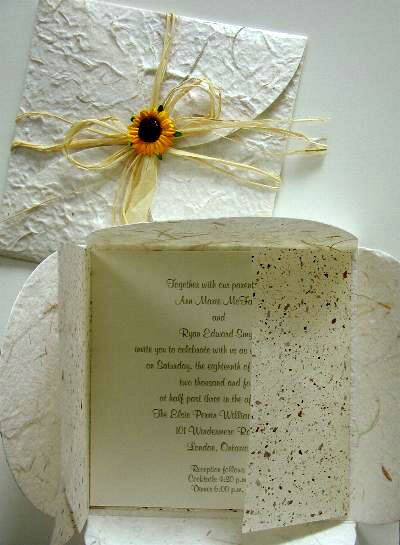 It begins with printing your invitation on five inch square ivory card stock which is then wrapped in heavy-weight flecked ecru tissue. This is all encased in your fibre rich ivory petal envelope... a sheet of eco-friendly handmade paper that has been specially cut to our specifications. Each side of the handmade paper is cut in a semi-circle so that when folded 'box-top style', it forms overlapping petals that meet in the centre. This can be tied with raffia, finished with a floral accent, sealing wax, or left as is and it's ready for insertion into it's ivory outer envelope for mailing. Your Petal Folder paper has rough textured ivory background and has bits of straw embedded in it... it not only is eco-friendly, it sets the tone for your eco-friendly wedding. Available in Daisy, Forget-Me-Not, Lavender, or Wildflower Seed, you'll be giving your guests a 'green favour' plus a perpetual reminder of your wedding day. 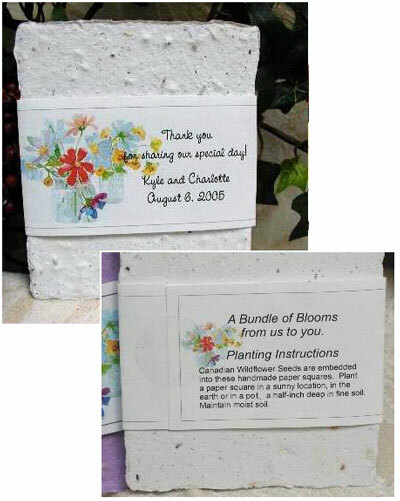 Each Eco-Friendly Seed Pack is printed with a poem of thanks and is personalized with your names and wedding date. 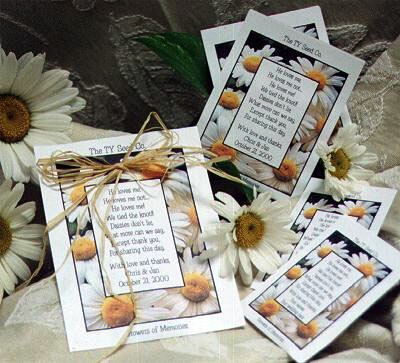 A favour that enhances the environment as the seeds bloom each year and the paper seed pack can be recycled. This favour couldn't be any more 'green'! Environmentally friendly handmade paper that is peppered with Wildflower Seed will be planted by your guests, paper and all, to produce living flowers. Just like the bean seed experiment that we all did in elementary school, the handmade paper keeps the seed moist until it germinates and then breaks down in the soil. The personalized paper band that surrounds your favour can be recycled in with regular recycling. And to make this favour even more appealing, it is actually made by hand right here in Canada!! 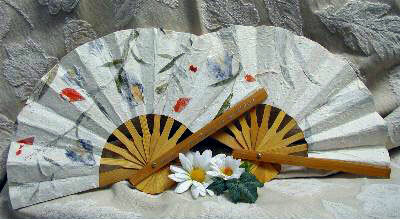 These gorgeous handmade paper fans will lend a beautiful touch to your tables whether they are used as part of your decor or as a green favour that will keep your guests cooled on a warm summer's eve. The Handmade Paper used in their construction is a natural green product hand-crafted in Asia and the spines are of bamboo which is a renewable resource. This green favour may even have you cutting back on the air-conditioning! Planning a seaside wedding and want it to be 'green'? Shells in all sizes will provide your eco-friendly table accents and they come small enough to be attached to your recyclable boxes for an accent from the sea on your favours. 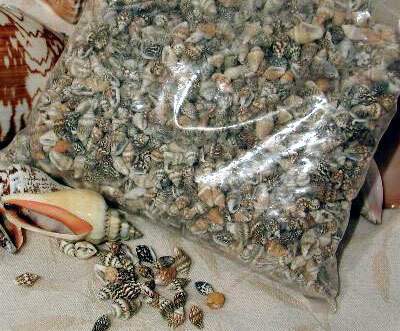 A huge bag will provide enough seashells to create craft projects like placecards, gift tags, or can be used to decorate your reception tables or to fill a decorative bowl. An eco-friendly green product, this three inch cube gift box is made from recycled paper, and features a pop up style construction that makes for easy assembly. These are shipped flat to reduce the size of shipping box required (and the amount of box material that will have to be recycled). 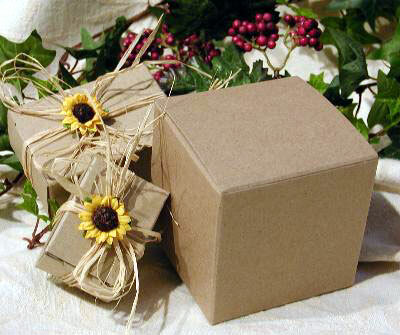 Shown in this photo with our smaller eco-friendly boxes, your guests can reuse your favour box for a small gift or recycle it.